Since my last update in January, Curiosity done more or less what I predicted. 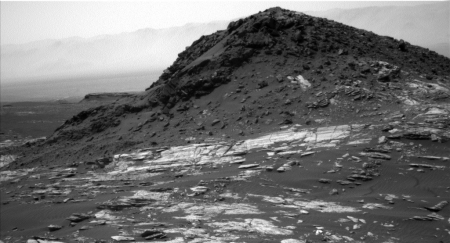 It headed southwest through the dune area and then made a side trip to the small mesa there, dubbed Ireson Hill by the Curiosity science team and shown on the right. They then made an additional side trip past the hill to get a close look a the large sandy dune field beyond, also shown on the right. After getting some nice closeups as well as scooping up some sand for observation, they have now gone back to Ireson Hill to get another close look at the dark rocks that have rolled off the top of the hill and are now in reach at its base. 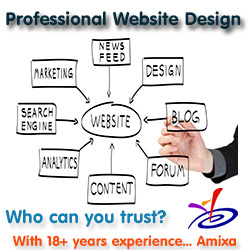 The image on the left shows the arm positioned above one of those rocks. The drill remains out of commission, with no word when they will try using it again. 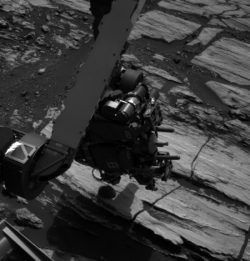 In addition, there had been a problem with the ChemCam laser that does spectroscopic analysis, but as of this week it is back in action, and is being used to analysis the small rock above. Below is an overview of their route so far as well as my annotations on where I think they will be heading in the future. You can see that the color of the terrain changes in the image’s lower right corner. That is when they will be getting close to the lower foothills shown in the second image of my January update. 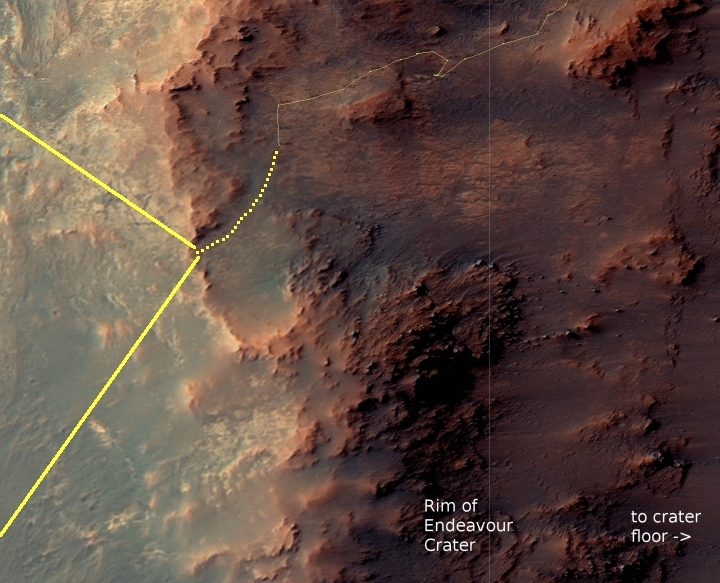 From this point, Curiosity’s journey will finally be entering the mountainous terrain of Mount Sharp. From then on the view should be quite spectacular, and endlessly changing. Since my January update Opportunity continued its slow climb out of the interior rim of Endeavour Crater, and has apparently now reached the rim’s outer edge. 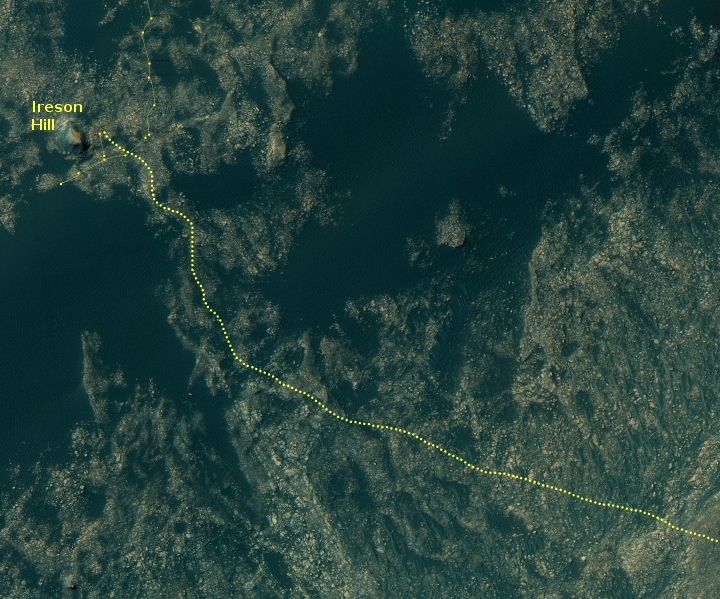 Below is the most recent traverse map, annotated to show my estimate of the more recent route as well as where I think the panorama below that is looking. 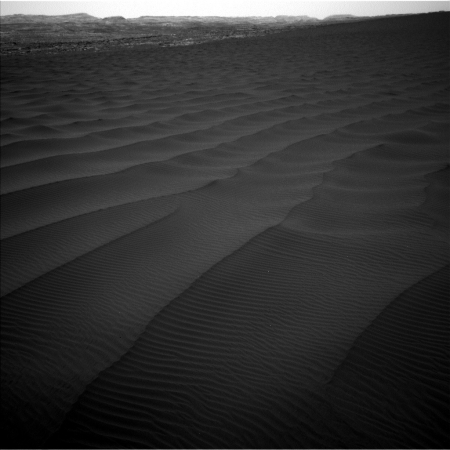 On Sol 4642 took an additional set of images showing a more detailed panorama looking to the southwest. The image below shows this new panorama, cropped and rotated by me to place the horizon level. It looks at the area above the bright patch in the leftmost image of the panorama above. Once out on the flats beyond the crater rim they will be heading south into this terrain. The plan is to skirt the outside edge of Endeavour Crater’s rim until they reach the meandering gully inside that rim, still to the south and outside the frame on the overhead image above. Mr Zimmerman, You are amazing. Follow you closely on John Batchlor at night.